Give your tummy a soothing treat. For those times when your belly needs a little extra love. Find comfort in an aromatic massage powered by fennel, peppermint and chamomile. Apply directly onto stomach as desired and massage in gently. A spicy licorice aroma that calms and rejuvenates the spirit. Delicate and herbal; lifts your spirit while calming and relaxing your mind. 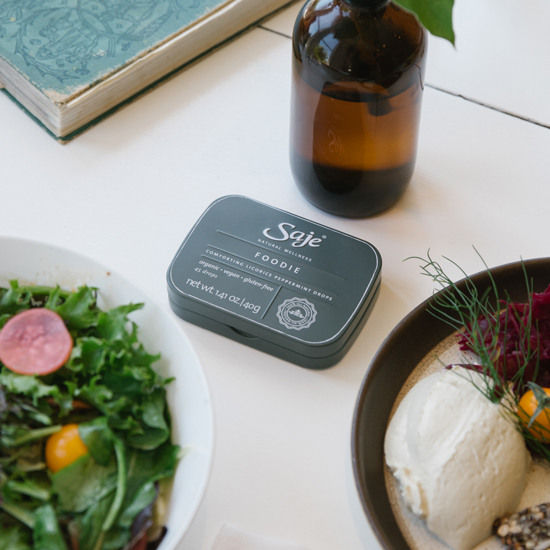 Pair with Foodie Licorice Peppermint Drops for extra comfort and refreshment after your meals. I have IBS and diverticulitis so I get severe cramps when I over eat or eat something hard to digest. I got a sampler of Gutzy thru a coworker and it worked! I have it now at the office and at home. I really helps diminishing the cramps and intensity when rubbed on my belly. I also like to inhale it too! I suffer from bouts of IBS, nausea, and a sensitive stomach in general. This oil has literally saved my life. Whenever I feel sick or have an upset stomach I rub this oil on to my tummy, rub my hands together & inhale. Within minutes I feel instant relief. It's astouding! Thank you Saje for all the wonderful products you have to offer. 5 stars from me! I've bought this as a part of the pocket farmacy and took it traveling to Ecuador...whether it was upset from the altitude or the food, this made me feel so much better! I have gutzy in my pocket pharmacy and I finally had to use it today. Just when I needed it the most. I applied it directly to my stomach and then massaged it in, not on my hand first and rub onto tummy - either way works I guess. And probably within 10 minutes, no more upset stomach. I'm amazed.